Guilds are social groups for people who want to have fun while playing Fiesta together! Membership is by invitation only and offers special privileges. 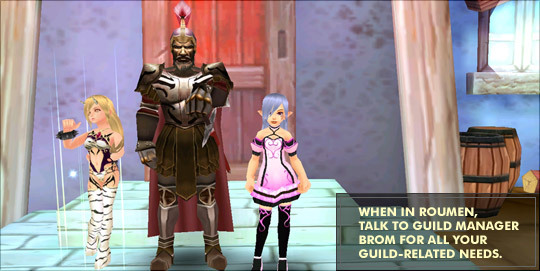 As a member of a guild you can easily chat with other guild members and find friends for quests or dungeons. Guild Academy members can even receive special items when leveling up! 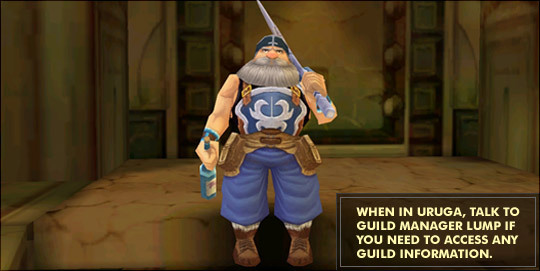 All guilds have one Guild Master, who may teleport to any guild member at any time. Other members may hold one of the following ranks: Administrator, Council Member, Guard, and Member. The Guild Master and Administrators may invite others to join the guild. If you want to join the guild, accept the invitation! All guilds have a shared storage space for items and money. To view your guild storage, visit the Guild Manager in any city. All guild members may view the guild storage and deposit items, but only the Guild Master may withdraw items. To view information about your Guild, open the Community window (press the ‘F’ key while playing Fiesta). Creating a Guild automatically creates a Guild Academy with the same name. A Guild Academy is for lower level players and an invitation is not required to join, making it a great place to meet new friends. Guild Academy members can even receive free items when leveling up! To set monetary rewards per level, click the ‘Reward Setting’ button. Add money to a row and members will automatically receive that amount each time they reach a level in the specified range. To set item rewards per level, click the ‘Item Reward Setting’ button. Drag items from your guild storage (click the ‘Guild Storage’ button) to any level and academy members will automatically receive it when they reach that level. All money and items awarded to Guild Academy members come from the Guild Storage. Guild Masters: Remember to add more money and items to keep rewarding your members! (press the ‘F’ key while playing Fiesta).